Multicultural New Zealand Multicultural New Zealand (MNZ) is excited about the policies and priorities of your government and wish to extend our offer to work in partnership with you to advance areas of mutual interest, of which there are many. As a truly pan-ethnic organisation with deep connections into the community and a constructive relationship with the government, Multicultural New Zealand is committed to serving the migrant and refugee communities in our journey towards a truly Treaty based multicultural New Zealand. We hope this briefing will ensure Ministers are aware of the important role that Multicultural New Zealand plays in today’s ethnically diverse society and that, as a new government, you will harness the opportunities to work with us towards a more inclusive and prosperous New Zealand. 1. Lead the development of a strategy to build capacity in our communities through fair equitable funding allocations for community organisations working with ethnic, migrant and refugee communities on a multi-year basis for basic operating costs. 6. Lead the reintroduction of social and cultural wellbeing as responsibilities of local government under the Local Government Act. 7. 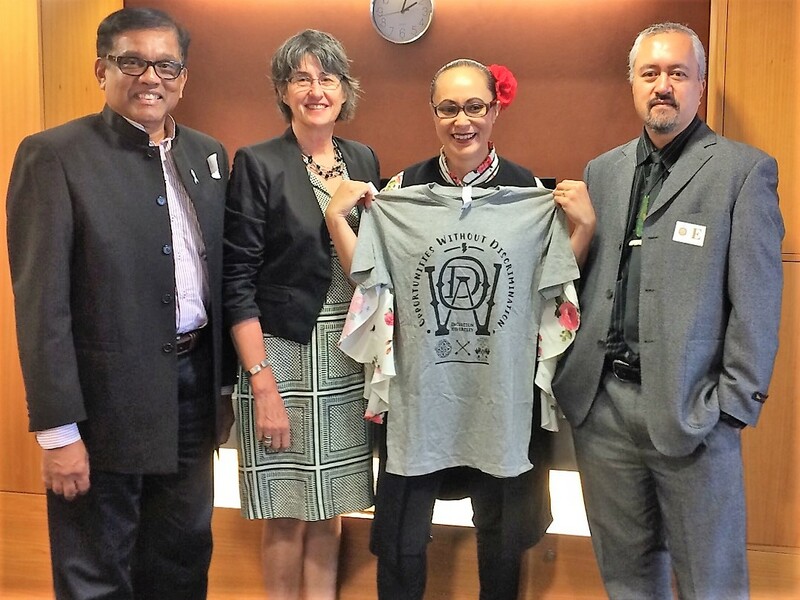 Provide New Zealand with community languages framework alongside the Pasifika languages framework and the Te Reo Māori strategy. 11. Lead the full review of the All of Government approach to recruitment to ensure that there is fair play in the market place. 13. Support temporary migrant workers to have access to free English language classes. 19. Improve the resourcing of volunteer groups in the ethnic sector. 20. Ensure laws and regulations are in place to stop the exploitation of students with temporary work visas. The key challenges facing Multicultural New Zealand and ethnic communities in New Zealand and recommended actions to address them are summarised below. Community groups such as MNZ, local multicultural councils, newcomers’ networks, migrant centres and other migrant service organisations provide voice and support for ethnic, migrant and refugee communities. We promote intercultural understanding, harmonious relations, integration, and successful settlement. We rely on volunteers, but need sustainable funding to coordinate, support and train them and to provide office and meeting spaces. We get very little help from government agencies to meet these basic operating costs. We have no certainty of on-going funding and have to apply annually for what we do receive. Philanthropic organisations as well as the government tend to fund on a project basis, which does not cover on-going staff and office costs. Last year the NZ Newcomers Network had to dissolve itself because of a lack of funding, and MNZ has taken over its functions with no extra money. Three months ago, Canterbury Migrant Centre had to close down for the same reason. Our experience shows that there is a huge backlog of integration issues with more recent migrant and refugee communities. We are aware that this exists because of the continued lack of investment in capacity building in volunteer organisations in this sector and the recent amendment to the local government act. As New Zealand becomes increasingly diverse, we need to ensure that people of different cultures are able to live and work together harmoniously and that we derive the greatest benefit from our ethnic diversity. We cannot leave this to chance – we must create the framework in which people from minority ethnic, migrant and refugee communities enjoy equal rights and are able to participate in and contribute to all aspects of life. We note the recent adoption of a Multicultural Strategy for Christchurch and an Auckland Languages Strategy as local examples. Nothing like these exists at the national level. There is evidence of structural and institutional discrimination (including unconscious bias) against more recent migrants from non-traditional source countries with English as a second language. Ethnic communities are under-represented in the staff, management and governance of public services, and public services are not well equipped for serving all communities equally. This is evidence of what has been called structural discrimination or institutional racism. Although there is recognition of this in parts of the public service, little is being done to achieve the changes necessary to equip our public services for a diverse society where people of different ethnicities and cultures have different needs and different modes of communication. There is increasing evidence of exploitation of temporary migrant workers and international students by unscrupulous employers. While the number of labour inspectors has been increased in recent years, we believe it is still insufficient. Temporary migrant workers can be in New Zealand for a considerable time, but there are few supports available to them (for example, those working in rural areas, or those who are not proficient in the English language). We support the government’s decision to manage migrant numbers to make New Zealand better. Like many others we are concerned about the lack of investment in social infrastructure to help achieve better settlement outcomes. We are also supportive of the skills based immigration system, which we help develop with the government in the late 1980s. We have volunteers in 57 locations throughout the country who do a huge amount to help migrants settle and integrate into New Zealand, and do so on a shoe string budget. With the closure of regional immigration offices in New Zealand and funding constraints, the burden to ensure that migrants are well supported so that can contribute to New Zealand falls to volunteers like us. There is an increasing number of international students arriving in New Zealand and, like for migrants, there is lack of investment in to support their cultural and wellbeing needs. Original generation time 1.0706 seconds. Cache Loaded in: 0.0386 seconds.